Fitting, Male to Male, Metric 14mm (1.5pitch) x 6AN Flare, With sealing Washer. 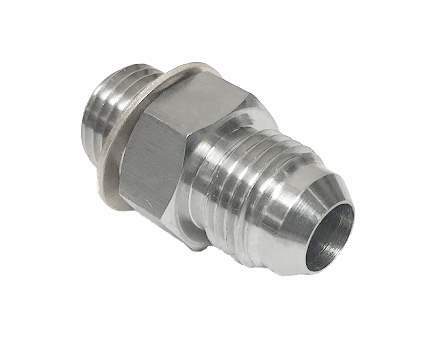 Provides easy way to connect to steel braided type lines with #6 AN hose ends. Appropriate for use on coolant or oil fittings. Commonly used for water jackets on ball bearing GT25R, GT/GTX28R, GT28RS, GT2871R, GT/GTX3071R, GT/GTX3076R, GT/GTX35R, GT35/40R, and some other turbos. Price is for (1) single unit.